Today (17th October 2008)'s issue of Ergo, a The Hindu group publication in Chennai carries my travelogue about Wayanad, Kerala. You can read the article through image below or visit www.goergo.in, go to ePaper section and navigate to page 10. I'd sent the above article in some 1800 words length, thinking they might carry it in two parts over 2 issues. I was asked to trim it down to 600 words and that was a tough task. The original one was 1800 words long, I suggested them to publish in 2 parts- Day 1 in one issue and Day 2 in next. But when asked to cut down to 600 words all I could write was "We went to place A, then to place B, then to C, halted for the day and next day we went to D,E F and returned to Bangalore"
Nevertheless I edited it to 599 words and resent it. Ergo team did a could job selecting a good title and extract for this article. A very detailed travelogue on Wayanad trip is already available hereand here. Getting into print more frequently these days-in times of India to take credit for my photograph and in Mint about mainstream media lifting content from web. But this article above bears additional significance as it is the first time my photo got published in print. (I'd been on TV twice earlier) The mint article had a screen print of my blog that included the tiny profile photo but that doesn't count. Thanks to Raviraj, Jayasimha and Raveesh for joining me in this Wayanad trip else this travelogue wouldn't have got published. In other updates, clicked this close up photo of moon at Binsar. 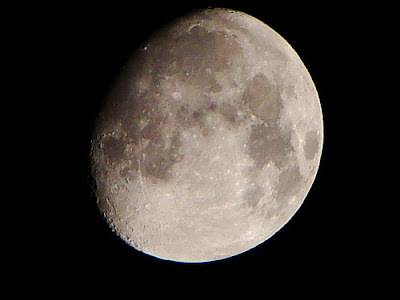 Never knew my DSC H50 can take me this close to moon. Check my photo blog more more photos. Congratulations on getting published. Did they pay you? Good stuff.. I don't think you are too far from earning money from your professionally amateur journalism experience.. Wish to see more articles from you getting published in various print media. Good going and all the best! Shrindihi, I asked about payment because a friend of mine once submitted a freelance article in one of the Hindu Group publications and they paid her 3K for the piece. Even the main site Gonomad.com (that hosts my blog) pays a small amount $25 for all the articles they publish on their main site. So, I was curious. Ok, thanks. Yes I have earned few hundred rupees via writing so far, but that is quite insignificant an amount. haven't tried some serious writing that can fetch me decent money- need to try it sometimes.